In a rather strange but very interesting fashion, Parashat Ekev which we read this week also paints us a picture of the human body, in a manner somewhat similar to a child’s drawing. Most of the body parts are there, but, from the outset, there are two major differences: (1) the order of drawing is somewhat different; and (2) the author is not a child, but rather God, quoted by Moshe in his final speech to the Jewish nation. Unlike the circle for the head, our parasha starts drawing from the bottom up and from the outside in. From the bottom, because the first body part mentioned is actually the one that gives name to the whole parasha: עקב – “Ekev”. והיה עקב תשמעון את המשפטים האלה – “And it will be because of your listening to these commandments”. In his commentary on the first verse of the parasha, Rashi points out that the word “ekev” means “heel”. All that Moshe promises the Jews, all the good things that Hashem will give them – the commentators explain – they will happen because we listened even to the so called ‘light’ commandments, the ones which a person normally tramples with their heel. In other words, the message is simple: if we are careful to listen closely and fulfill even those minute rules, the commandments that most people simply ignore and move on from – then surely we will be very careful with the more important and complicated ones, and so Hashem will reward us with His blessing. The first instance is in the Book of Genesis, where, in the Garden of Eden, the first humans, Adam and Eve, receive the very first commandment from God: don’t eat from the Tree of Knowledge. The first commandment received is also the first one humans trample with their heel: Eve eats the fruit, she gives Adam to eat also, and thus they are both banished from the garden. On their way out, God gives, measure for measure, the first punishment to the other player in the story, the serpent: “Eve will smash your head and you will bite her heel”. The second instance is also in Genesis, where our forefather Jacob is born holding on to his brother’s heel – thus the name יעקב – Yaakov from the same root: עקב (“heel”). Only after many years of soul searching and self-defining, as well as after a direct encounter with the Divine (namely the fight with the angel), Yaakov puts aside the connection to the heel and becomes Yisrael, the one who prevailed. The second body part mentioned in our parasha is the ear. “It will be [good for you] because of your listening” (which people normally do with their ears) – the Torah says. It is a strange association: heels and ears, but hardly a random one. The idea is simple and somehow, it draws the same circle as a child would, only this time the circle encompasses the person, rather than representing just the head. What do I mean by that? People trample God’s instructions with their heels (which are located all the way at the bottom, below their being). From above, however, God reaches out and talks into the person’s ears (located up, on the head), in order to encourage them to pay attention. A spiritual voice from above counteracts the basic instinct from below. And thus the circle around the person is drawn, not in ink or crayon, but in words and deeds. Interesting, no? Next on our hypothetical child’s drawing to-do list were the eyes. And they are next in our parasha also. In the Torah, the eyes are often a symbol of revelation, of deep understanding and awe. For example, at Mount Moriah, Abraham “saw the mountain from afar”. At Sinai, the Jews “saw the thunder of God’s presence”. During the Creation of the World, God “saw that it was good”. Many things reach our eyes. In fact, science tells us that sight is, for the huge majority of people, the primary sense. Seeing is believing. A picture is worth a thousand words. The Torah takes a different approach. Yes, we do see many things, but not everything we are shown is true, not everything we see (and want) is good for us. If we really use our eyes – more precisely the inner eye – like Abraham did at Moriah or like we did as a people at Sinai, then we are on track for a revelation. However, if we just take in everything that catches our eye, things can go bad. Look at the world today, for example… How many distractions we see around us? How many doctored photos and videos float around, showing us perfect super‑models, creating the illusion of success when there is none, or encouraging us to “keep up with the Joneses”? Or – to make it even more personal and meaningful – how many photoshopped pictures and videos the world has been shown in which the State of Israel and the Jews are portrayed as “murderers and oppressors of innocent freedom fighters”? How many pairs of eyes have seen them, and how many people unfortunately mistook all those lies for the truth? By using the paradigm of the eyes, our parasha provides a simple message: don’t believe all that you see! Use common sense and your God given ability to look past appearances. And if God (Who knows a bit more than you, even about you) tells you what is right and what is wrong, don’t follow your eyes, but rather listen to what you are told. Shema Yisrael. Listen, use your ears, Israel! Yes, the mouth is our apparent primary means of bringing in nourishment. But the operative word here is “apparent”, as this kind of nourishment is not all in life. Again, we are reminded that we are not just material beings who simply eat and drink. We are also spiritual beings, who “feed” on our connection to the One Above. In Jewish tradition, when we eat or drink, we seek to elevate what goes into our mouth to a higher level. We make a bracha over food, before and after. We make Kiddush over wine to welcome in our holiest of days, the Shabbat. And we make Havdalah at the end of it (again, with a bracha), as a means of distinguishing bein kodesh le’chol, between the holy and the profane. In Jewish tradition, we are also very careful about what comes out of our mouth. Lashon ha’ra (evil gossip, taking bad about another person) is one of the gravest sins mentioned in the Torah. For it, the whole body gets afflicted, as the Torah points out in its description of tzaraat, Biblical leprosy. In other words, when the mouth goes astray, our whole being goes astray. The hands and feet are next, although they are mentioned only en passant. ונתן מלכיהם בידך – “The kings of the Cannanite nations, God will give into your hand”. With the hands, we receive God’s gift. And that gift comes at the end of forty years in the desert, forty years in which God also took care of our entire body. By all definitions of science, what happened to our hands and feet (and, by extension, to our whole body) in the desert was a pure miracle. By right and logic, our feet should have swelled, our garments should have worn out, and our hands alone should have never been able to accomplish the victory over nations who were much stronger than us. It was all the work of God! The Midrash (quoted by Rashi) tells us that the Ananei Ha’Kavod, the Clouds of Divine Glory accompanied us in the desert, they gave us shade from the scorching sun and protection from the Egyptians, they protected our feet from the rough desert sand, and they steam-pressed our clothes every days so they looked like new even at the end of forty years. Also, it was God’s outstretched arm and hand that liberated us from Egypt. From His hand, we received the manna. And – to bring it closer to our times and to our season – it is His hand that writes our fate in the Book of Life on Rosh Hashanah. His bestowing hand and our receiving hand: a powerful image! But no body part mentioned so far even dares to compare to the one our parasha talks about more than anything. 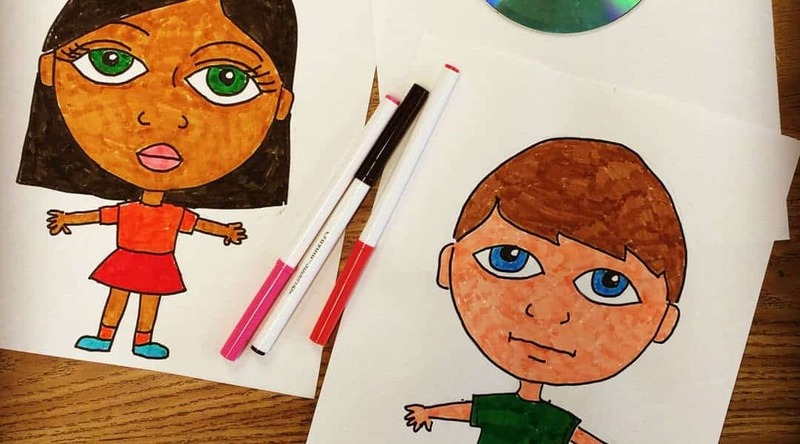 It is – by contrast to all others – the only body part that would probably never show on the child’s simple drawing, unless perhaps if it was made for a very special person (like a parent) and for a very special occasion (like a birthday). The body part in question is the heart. Almost twenty times, the heart is mentioned in our parasha! The heart is the core of our being. In our parasha, it is both the object of God’s testing and of God’s love. It is also the conduit, the path, the means of our most direct communication with God. And thus, we are told that we must always take care of it, we must nourish it with spirituality, we must protect it from the temptations of haughtiness and vanity, and we must let it fill with LOVE. Only then can we aspire to become what God intended us to be: a gathering of spiritual beings, a true mirror image of our Creator, an Am Kadosh (a holy nation) before whom, as the parsha concludes: “lo ityatzev ish bifneichem” – “No man will stand up against”. Can you see the child’s full drawing now? Can you see with your mind’s eye all the body parts, external and internal, connected in the most beautiful image ever? Well, this is our task: to rise and raise ourselves to the level where we can create that image! With all that has been given to us by the Almighty (eyes, ears, mouth, hands, feet and heart), with all the good advice He set before us in our holy books, with all our abilities and ambition – the challenge is before each and every one of us, in each and every generation. May we hear the message and understand the symbolism, and may we hone our self-portrait skills until they become – as the saying goes – picture perfect.